Many things have changed since the debut of the Fossil Rim Natural Resources Department in August 2018. This department previously existed thanks to the hard work of staff member Curt Decker, but it was discontinued in 2010. A somewhat similar branch of Fossil Rim – Recycling and Waste Conversion Department – was founded in January 2017, but soon upgraded to encompass water, wastewater, land management, and volunteer projects on top of the previously established educational resources of all recycling, both traditional and nontraditional, along with producing compost. 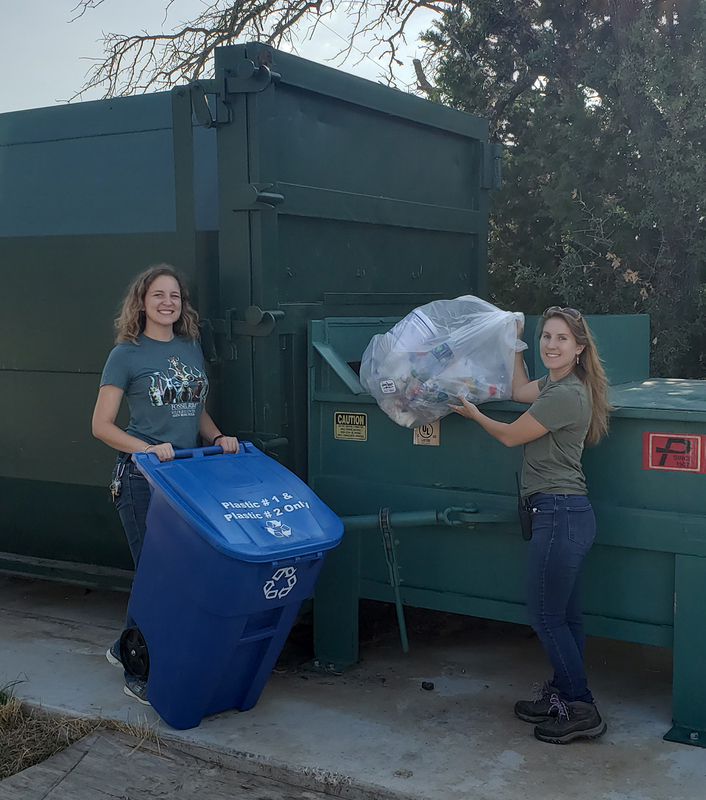 Caitlin Pyle (left) and Vanessa Hays learned how to work as a team quickly while creating new recycling protocols for all of the recyclable material at Fossil Rim. “We couldn’t have made it happen without the support of Fossil Rim, investing in recycling and choosing to put the priority on our environmental impact and not just the dollar,” Pyle said. This expansion promoted the department name change to “natural resources”. Manager Caitlin Pyle and Management Specialist Vanessa Hays are focused on continued growth and improvement of this department. The world has not been kind to traditional recyclables, specifically plastic. In 2018, Fossil Rim was able to recycle single-stream items, but that changed in early 2019. The global recycling crisis made it difficult for many companies to properly recycle. After some thorough and aggressive research, calling different companies, and almost giving up, we were able to develop permanent or tentative plans for all of Fossil Rim’s traditional recyclables while researching ways to recycle nontraditional items, as well. It was important for us to keep recycling traditional items available for Fossil Rim staff even when it wasn’t the most prudent approach. However, we mainly focus on reducing and reusing within our facility. We had little-to-no experience in the realm of wastewater. We have a passion for biology and studied it accordingly. While the subject of biology relates to wastewater treatment, it was a whole different arena we weren’t familiar with, but were ready to metaphorically dive in! We were given the wastewater treatment plant like someone gives a white elephant gift. We weren’t entirely certain if we were excited or apprehensive about the opportunity, but with the help of Project Manager Louis Pienaar, we were up for the challenge. Initially, we handled the plant like first responders, doing our best to quickly treat symptoms, but were unable to resolve the underlying causes. Roughly six months later, we are actively managing the plant and establishing preventative treatment. 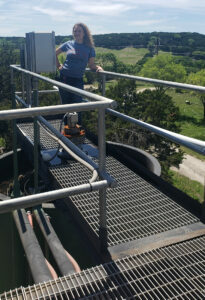 The wastewater treatment plant is a daily responsibility that we take great pride in. We have the opportunity to manage billions of tiny bacteria to help us with a problem – what to do with organic waste we no longer need. These “tiny critters” work tirelessly breaking down material that otherwise would go to a landfill. Similarly, there are billions of bacteria hard at work within the compost piles, and the natural resources ladies do their best to provide the proper environment and nutrients to all their little critters. When Vanessa started at Fossil Rim, she did not have experience operating heavy machinery. 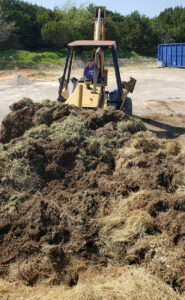 In the past six months, she has become proficient at Fossil Rim’s large front-end loader/backhoe to turn and shift each of our five established compost rows (windrows). These windrows are roughly 100 feet long and up to six feet high, filled with large amounts of old hay, manure, and food scraps that are added daily. This allows the breakdown of the material and produces nutrient-rich compost. This is used within Fossil Rim for a natural fertilizer on our oats and hayfields, as well as beautification projects within the park. Decomposers, microorganisms, and other invertebrates are huge contributors for a productive compost facility and, just like large animals, they need to be properly cared for. The animal care department does a wonderful job taking care of the large critters that call Fossil Rim home, while the natural resources department takes pride in taking care of the tiny critters. The composting programming and partnership between Fossil Rim and the Glen Rose Intermediate School was established the summer of 2017 and has been a bright light for Fossil Rim. In 2019, our natural resources efforts expanded into the Glen Rose Junior High School. 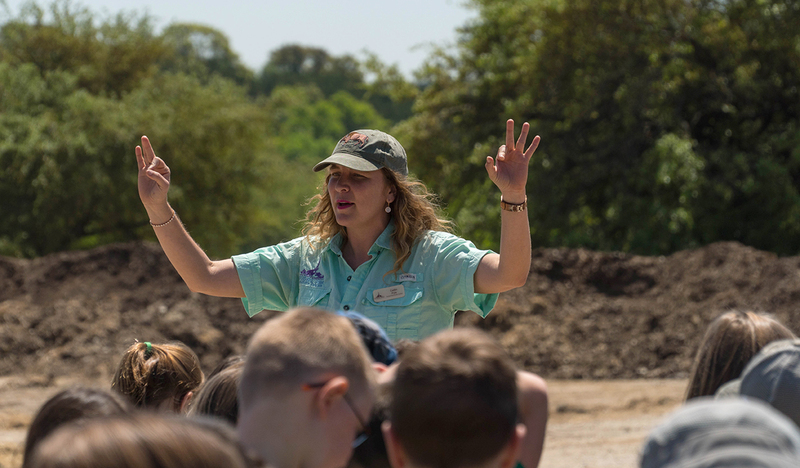 “Having the opportunity for our compost facility to become an outdoor classroom for Glen Rose ISD students, Fossil Rim staff and interns, as well as guests, is one of the highlights of this job,” said Caitlin Pyle. It fills our hearts when these students leave Fossil Rim feeling empowered and a part of the solution. 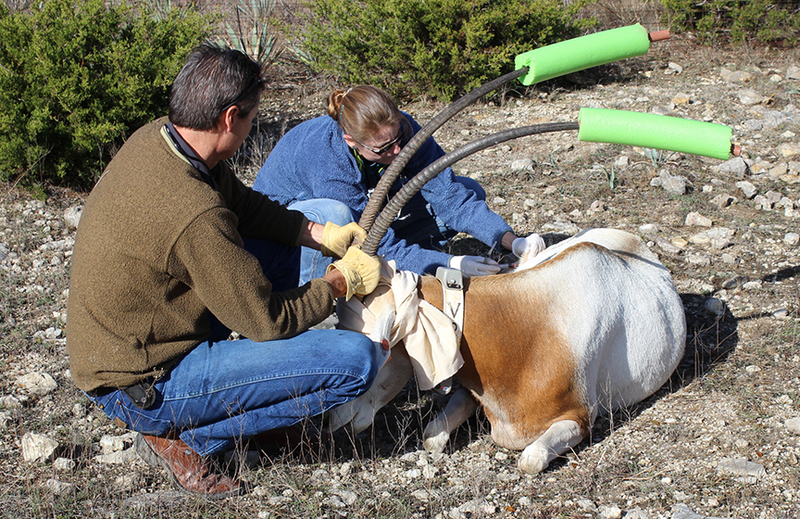 We have teamed up with the Fossil Rim Education Department to create more immersive and diverse natural resources programing for our local community, as well as for our guests. We will continue to grow our partnership with these students and teachers, as we strengthen the ties between the natural resources department and Glen Rose ISD.